The environmental impact of the Three Gorges Dam has been less than originally forecast, a senior project official said Wednesday. Wang Xiaofeng, director of the Office of Three Gorges Project Construction Committee of the State Council, said: "The impact has not gone beyond the scope predicted in a 1991 feasibility report. In some aspects, it is not as severe as predicted." Work on the 180 billion yuan ($22.5 billion) project on the middle reaches of the Yangtze River, which started in 1993, is expected to be completed by 2009. To protect the environment, seven pilot projects have been designed to prevent pollutant discharge, improve biological diversity, and ensure drinking water quality in the area, said Wang. The pilot projects in cities including Chongqing, Shanghai and Yichang, will also be completed by 2009, and involve the ministries of communications, agriculture and the State Environment and Protection Administration. The committee is also setting up a monitoring system to evaluate environment protection work. "We want to build not only a first-class hydropower project, but also a good environment," Wang told China Daily. The project has had more positive, than negative, impact on the ecosystem, Wang said. No major geological disaster has been reported in the reservoir area since the water level was raised to 156 meters last year. Han Qiwei, a member of the Chinese Academy of Sciences, said the project is not to blame for some ecological problems in the Yangtze River that predate the building of the dam. 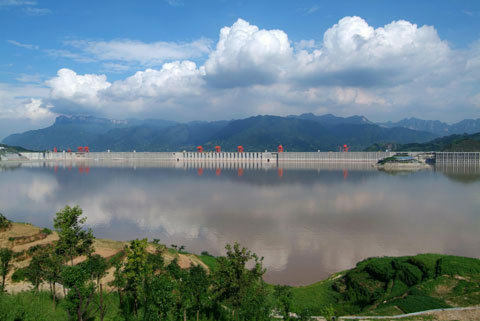 The project plays a key role in clean energy production and flood prevention, Han pointed out. This summer, the dam was used for the first time in flood prevention, protecting the 60 million people in the lower reaches of the Yangtze from flooding, Wang Zhongfa, dean of the water resources department of Hubei Province, said. The government has pumped in huge amounts of money to prevent geological and ecological disasters in the reservoir area, which used to witness frequent landslides before the dam was built. About 40 billion yuan ($5.33 billion) will be spent between 2001 and 2010 to build at least 150 sewage treatment plants and 170 urban garbage disposal centers to prevent water pollution in the dam area and the upper reaches of the Yangtze River. Till September, about 112 billion yuan ($14 billion) was spent for major project works and relocation of affected people.